Closing out four nights of his residency at Schuba’s Tavern in Chicago, where the setlist on this last night was set by fan requests sent in over Twitter, Walker’s material included new songs, songs that were never released (oftentimes with good reason, he reminded the audience), and a good deal of songs stretching back to his days in the late ’90s with rock band Marvelous 3. Alternating between being charming, somewhat jittery, and incredibly self-deprecating, Butch Walker kept the crowd entertained for his 90-minute set. Repeatedly reminding the audience that he wasn’t the one that picked the setlist, Walker shuffled through a stack of lyrics to songs that he hadn’t played in years. He forgot words, cut songs short because he couldn’t remember them, made bad “that’s what she said” jokes, and apologized several times for some of the songs he sung. From just about anyone else, the lack of polish would come off as unprofessional, but for Butch Walker, the show was just one big sing-along party. Even “Vampires in Love,” a song from Marvelous 3’s 1998 release, Hey! Album, which he mocked as being one of the stupidest songs he’d ever written, was met with a happy sing-along from the audience. He seemed genuinely surprised that the audience was with him for every last word. There was even at least one song in which Walker didn’t sing a single word; he just happily strummed along and let the audience take the lead. For the last song of the night, Walker unplugged his guitar and sat on the railing at the corner of the stage, treating the audience to an unplugged version of “Take Tomorrow (One Day at a Time)” — a nice, laid-back way to end the evening. Walker was joined for part of his set by Gregory Macdonald, who can usually be found playing keyboards with Canadian rock band Sloan. Song selections for the evening included “Cigarette Lighter Love Song”, “Suburbia”, “Best Thing You Never Had”, “Grant Park”, “Beautiful”, “Every Monday”, “Valium”, “Canadian Ten”, “Let Me Go”, and “Wreck Me”. Butch Walker is also notable for his cover songs (I think I may actually have first heard of him through covers, actually), so of course the setlist included some covers, including “Always Something There to Remind Me”, “Laid” (which absolutely sounded like a Butch Walker song but is apparently by English rock band James), a Sloan cover, and a mashup of “I’m a Believer” and “El Scorcho”. If you read about opening band Gold Motel, you’d be surprised to know that they’re a new group — they just performed their first show together in December. So how does a brand new band with only one self-released EP wind up opening for four sold out Butch Walker shows? Well, the fact that the woman behind Gold Motel — Greta Morgan — was also part of the Hush Sound (currently on hiatus) might have something to do with it. Morgan’s vocals belie her young age, and their short set was certainly a treat to watch. Looking forward to hearing more from this young but very talented group. Behind the jump is video (not mine) of Butch Walker singing “Cigarette Lighter Love Song”. 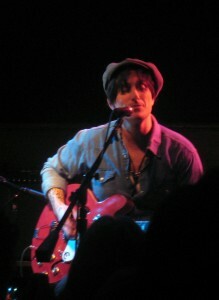 Nearly every song he did at the show is up on Youtube, so go do a search for Butch Walker and Chicago and check it out. My photos from the show can be found over at Flickr.